This strikingly sculptural piece from Trinidadian furniture designer Scot Sardinha is designed to function as three different items: a coffee table, a bench or a lounger thereby accommodating whatever design needs you may have. The sleek lines are cut to precision using CNC technology and constructed with high grade ¾” maple plywood. The piece above is shown in a natural finish but custom finishes are also available. 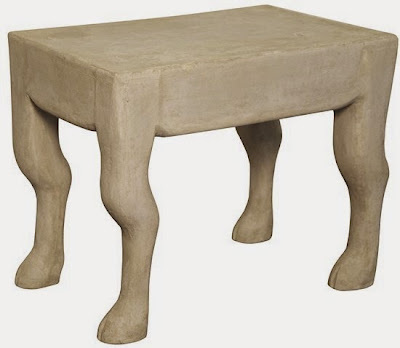 Gregory Nelmes Home celebrated the launch of a new line of furniture last week and one of the more notable items was the Arthur Stool by LA-based Noir, an eye-catching, whimsical seat made from cement which can be used both in- and outdoors. 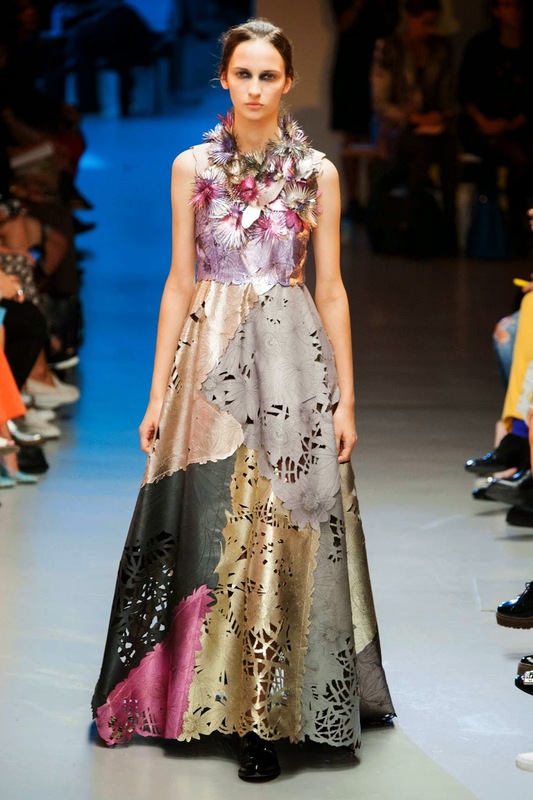 We saw a riot of colour at Blumarine where flowers were strategically placed over flesh-coloured sheer fabric. Double denim, floaty fabrics, frills and fun fur form the basis of a '70s-strong collection from Giamba. Perhaps Jenna Lyons was the muse at DSquared2 where the models sported the slicked-back hair and heavy frames favoured by the fashion icon. The clothes were sporty and colour-blocked in bright colours, while feathers and shoes made a definite statement. With excessive ruffles, frills and sequins the designers definitely had fun playing with proportion and texture. Fierce fashion in more than one sense from Giles where tiger and snake imagery and beautifully detailed appliqués showed up on laser-cut dresses. London seems to be big on the bright, punchy colours for Spring 2015 and it's no exception at Peter Pilotto who offered acid brights and foliage. Patchwork dresses and coats referenced stained glass windows and resin flowers offered additional embellishment. The show ended with softly draped Grecian dresses. The term "appliqué" is going to be a bit overused today, starting with this collection from Erdem who gave us beautiful, ethereal gowns and dresses for spring. The clothes felt lush covered as they were with palm and floral prints, appliqués and feathers. There were also standout, modernised versions of Victorian lace and broderie anglaise dresses. One of the more highly anticipated collections, Burberry Porsum showed pretty shift dresses covered in oversized palettes which were made less precious with the addition of denim jackets which had either hints of feather or shearling peeping from the hem or collar. Sheer dresses and skirts were pleated and layered to give them substance and the models wore trainers or flat sandals with cork soles. 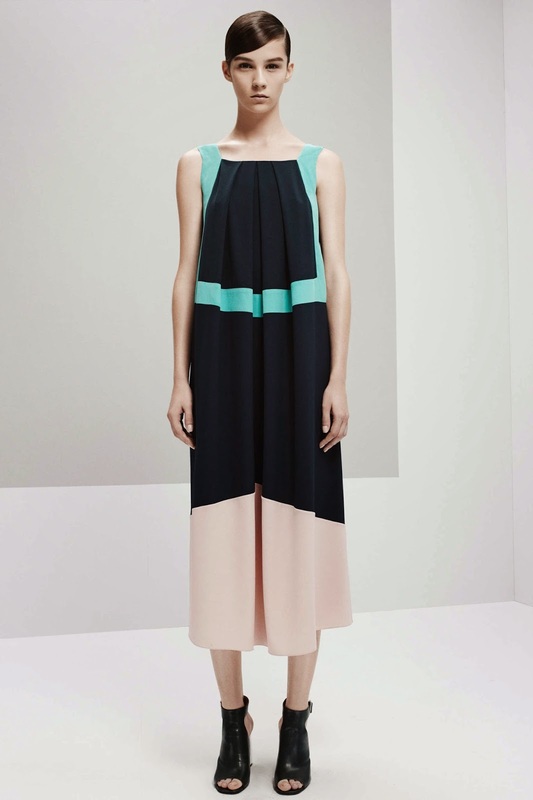 Graphic elements and colourblocking in bright, acidic colours from Roksanda Ilincic for Spring. Origami-esque draping added interest to the clothes. 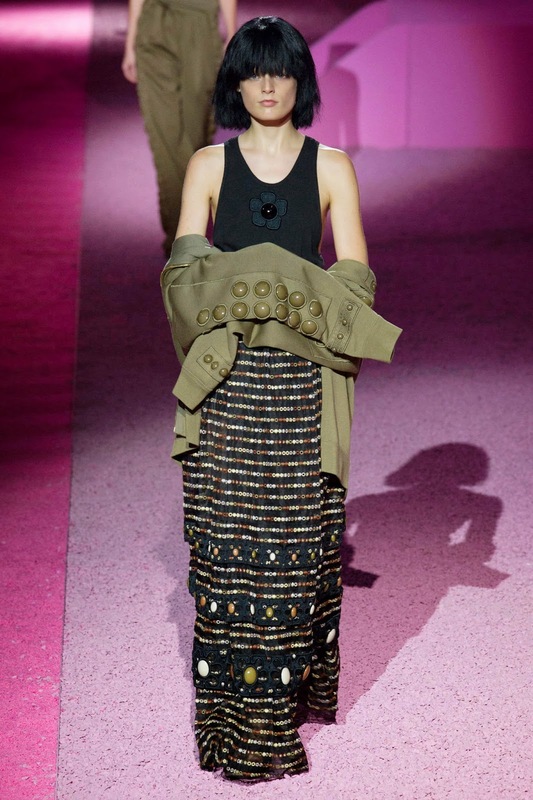 The conflicts currently waging around the globe appear to have provided the inspiration for Marc Jacobs who has based his Spring 2015 on the military. Voluminous, utilitarian outfits in khaki and olive green opened the show and these simpler pieces gradually transitioned into more feminine, intricate and embellished dresses, trousers and jumpsuits. The looks featured multiple pockets and epaulettes and were often belted for shape. Clear vinyl piped in black or white and deconstructed hems add an interesting touch to the knitwear found at Osklen. Fringing adds a textural element reminiscent of tropical thatched roofs particularly when paired with palm leaf shorts and jumpsuits. A sleekly modern collection from Jason Wu at Hugo Boss. i*a favourite Delpozo stuns once again with a flawless collection for Spring 2015. Oversized blurred florals and photorealistic prints adorned Carolina Herrera's ladylike gowns and dresses. The fractured floral tops and evening dresses were a modern sort of embellishment and proved to be the real standout pieces of the collection. 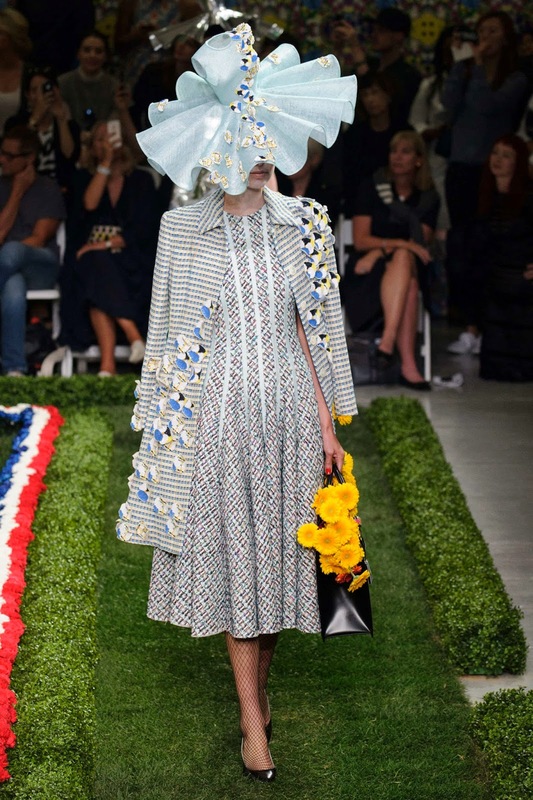 Thom Browne gives us another surreal production which was intended to be a visual fairy tale of six sisters with coordinating wardrobes. In spite of the spectacle and showmanship, Browne delivers, as usual, impeccably tailored coats, jackets and dresses. It is precisely because he delivers on the clothing front that he can get away with putting on one of the more outlandish shows of the season which included models crowned in millinery created by Stephen Jones designed to look like skeletal bags or miniature outfits of the looks they wore. 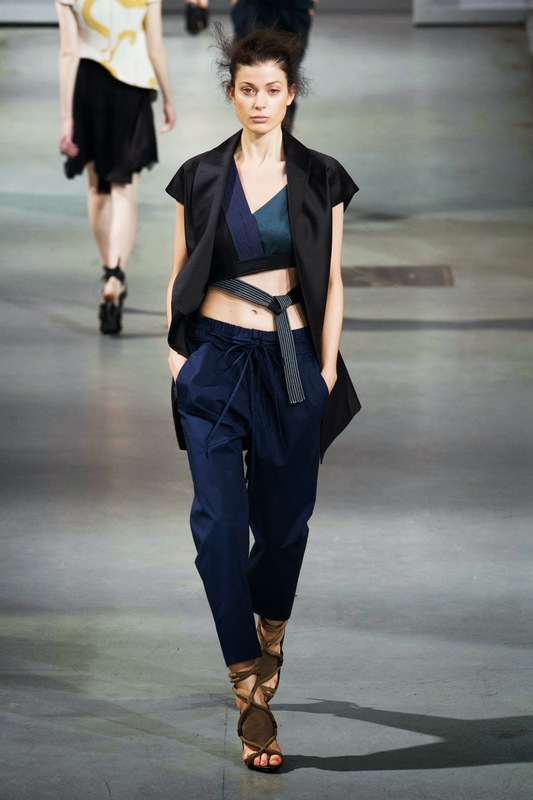 Gorgeous, sculptural, directional looks from 3.1 Philip Lim which took their cue from interior design. The clothes made from heavy damask fabric with piping curved and wrapped around the bodies of the artfully windswept models. The models at the Marc by Marc Jacobs show looked like they were ready for spring showers with their rubber boots, bags, sleeves, leggings and oversized parkas. 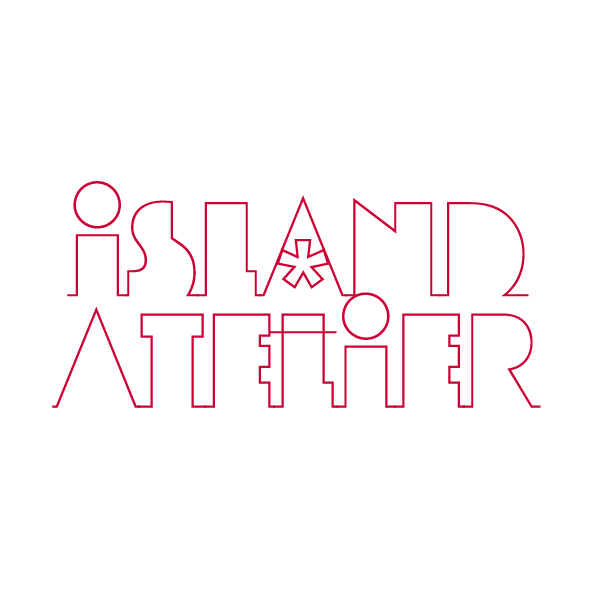 Interspaced between 90s-style slip-dresses were slogan shirts, boilers suits and utilitarian aprons. There was some tailoring (inevitably cropped at the waist) as well as bustier tops worn over button-down shirts which morphed into half-bustier, half-jacket tops which were paired with polkadots, pleats and plaid. All the reviews of the New York ready to wear shows we have read this week have said that the particular collection was "well received". This had us wondering: are any of the shows ever described as being poorly received and given critical reviews? We ask only because this year, it seems that many of our favourite designers have fallen a little short of the mark and failed to light a fire with their offerings. 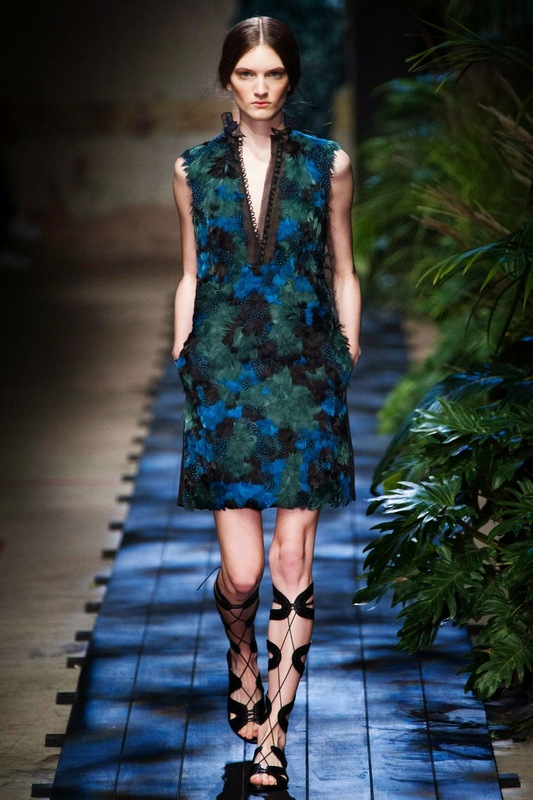 Tory Burch has produced a very commercially viable collection inspired by artists Francoise Gilot and Pablo Picasso. As a designer in business she is a classic example of someone who knows her customer well and delivers consistently from season to season. This being said, the clothes coming down the runway were both elegant and sophisticated harping back to her usual tribal influences. In our opinion, the second half of the show was stronger than the first and we particularly liked the outfits in the calming blues and creams which closed the show as well as the desert booties that some of the models wore. Simple, monastic-like, textural clothes in raw silk from The Row. Pretty, traditional Asian prints of landscapes as well as imagery of birds and bamboo and flowers cover a very modern looking collection from Vivienne Tam. A pretty, balletic collection from Tracy Reese. We are loving DKNY's colour palette and overall look (although the chav-ish hairstyle makes us cringe) all of which contribute to one of our favourite collections from this line in a long time. Sportswear continues to be the big trend coming down the runway for next spring and DKNY have emboldened this with abstract, geometric patterns. Pretty spring looks from Diane von Furstenberg consisting of gorgeous gingham dresses and flowered shifts. There was a definite pull away from the iconic wrap dress although it did show up on the runway as a much shorter and sexier version. Many of the collections we've featured so far are pretty streamlined and minimalistic with little fuss and embellishment. This collection by Araks meets all of these criteria with the addition of a slightly 1970s vibe. New York fashion week seems to have gotten off to a slow start this year. While many designers showed a handful of interesting looks, we've been struggling to find collections that are strong in their entirety but finally Opening Ceremony have provided just that. With interesting layered looks, some asymmetry and culottes we might actually deign to wear, Opening Ceremony managed to mix sporty with checks and patterns, sleeveless coats and perforation pretty successfully. Alexander Wang is still firmly in the sporting camp, however this time the sportswear manifests as futuristic, feminine and flirty. The show began with tailored and often belted structured pantsuits and then transitioned into several body-conscious looks. The clothes appeared to be both structured and soft with intricately woven bodices complementing flowing, pleated miniskirts which were, in our opinion, some of the strongest looks of the show. 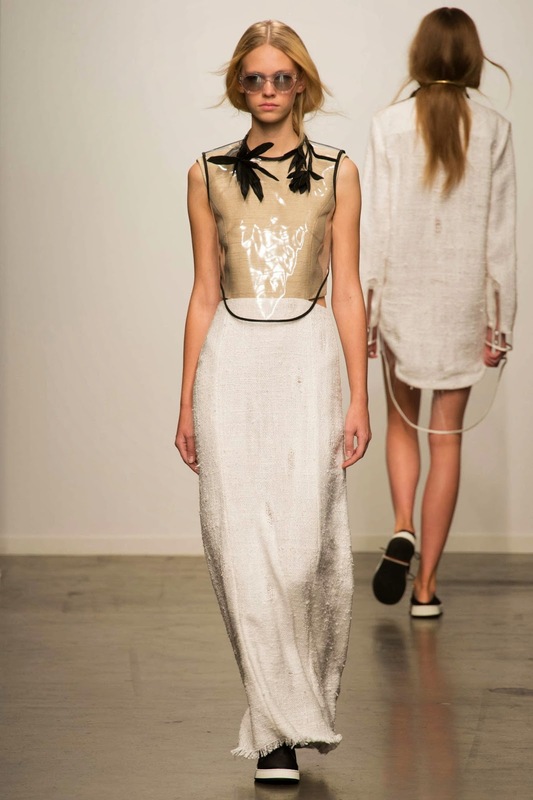 The woven bodices make a reappearance in the form of beaded cropped tops paired with high-waisted trousers. 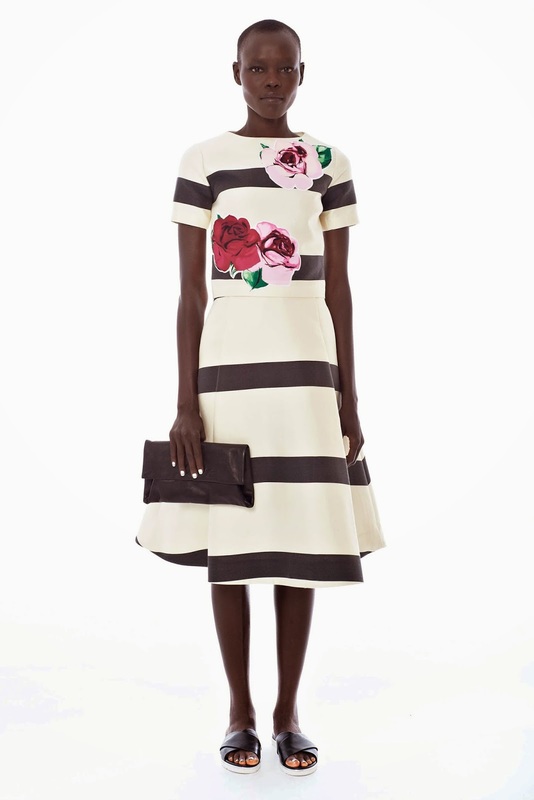 We have a real weakness for a pretty, preppy stripe and no one does it better than Kate Spade, whose Spring 2015 collection is replete with kitsch and whimsy accessories and gorgeously striped dresses and skirts in a not-so-nautical shades of black and royal green as well floral touches. From photorealistic prints of swimming pools to brightly coloured blooms, the collection is geared towards those who are looking for an escape from ordinary life. Double denim and deconstructed hems feature in this boho collection from Ulla Johnson. Monique Lhuillier puts an emphasis on volume on the lower half of the body with this extremely feminine, candy-coloured collection for Spring 2015 which featured embellishment and gowns suitable for the red carpet. With a minimalist colour palette of black, white and silver, there's a distinctly masculine feel about Sally LaPointe's collection and the models paraded down the runway in brogues carrying structured bags that could double as briefcases. Softer touches were added with the use of asymmetrical hems, boat-necked tops and fluted sleeves, while feathers and fringing were used for texture. Overall it was quite a conservative collection with longer hemlines featuring prominently and the layering of trousers under skirts. Bare skin appeared rarely and then only under sheer layers or through zippered slits. Nicole Miller casts an eye on the tropics with this lively and bright collection of dresses and separates which were covered in pineapples, bananas and tropical flowers. Grounding the designs in black gave the collection an added level of sophistication. 'X' marks the spot with the Band of Outsiders' presentation which featured converging geometric lines. Mainly separates, the clothes included rumpled linen suits, patterned a-line dresses and lightweight coats. There was a distinctly tropical feel about the collection with coconut and palm trees showing up on the clothes which were also covered in ladybirds, stripes and floral patterns. Everything was topped off with a straw bucket hat which gets our vote to replace the fedora next year. 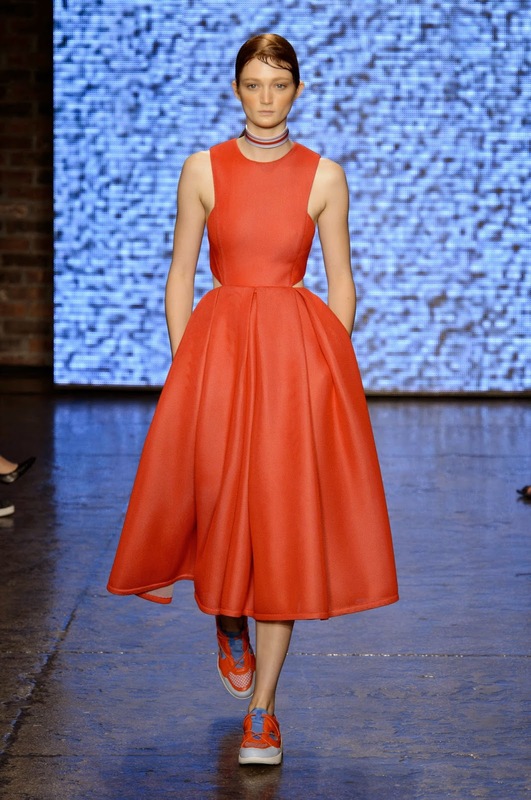 Let's get coverage of the Spring 2015 ready-to-wear shows which are kicking off in New York this week started with a look at some presentations. First off the starter's block is this highly imaginative collection from Mimi Plange which juxtaposes structured and soft silhouettes together, unified by a soft blush palette which becomes progressively bolder. There are some old tropes in the collection including a couple of bomber jackets, but the designer is strongest with the judicious use of pattern and playful shapes which help to elevate otherwise ordinary shift dresses and cropped tops. 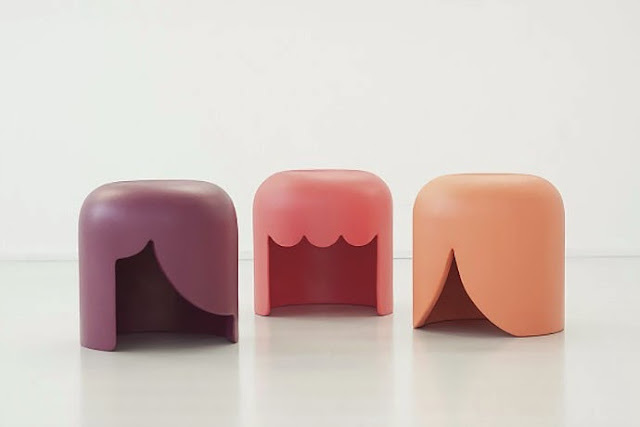 If these Playmobilia Stools by Tania Da Cruz look familiar it's because the seating range was inspired by the hairstyles of Playmobil toys. The Portuguese designer’s prototypes were exhibited in Milan earlier this year.